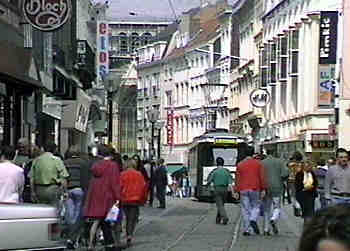 Pollution free trams calmly gliding through city-centre pedestrian zones in Gent, Belgium; Zürich, Switzerland; Strasbourg, France; and Manchester, England. 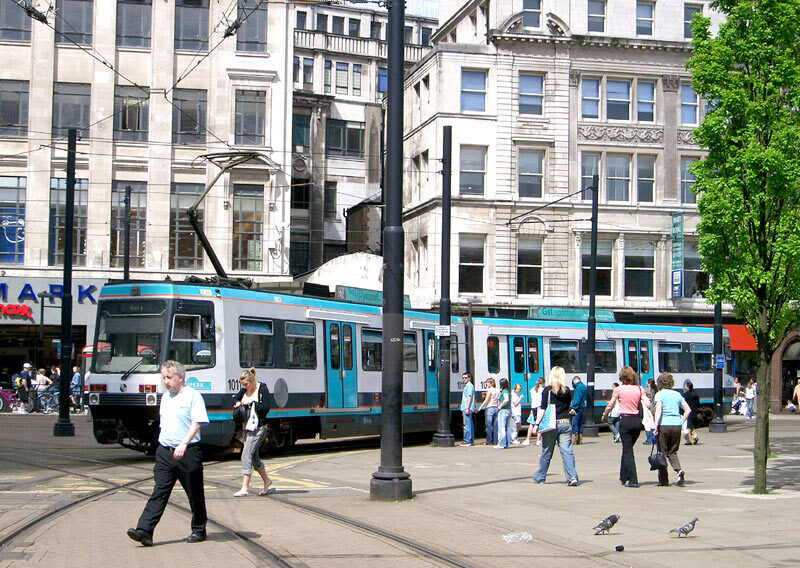 Note how only Manchester sports a forest of overhead wire support poles... the other cities either use wall mounted rosettes or mask the poles with trees. 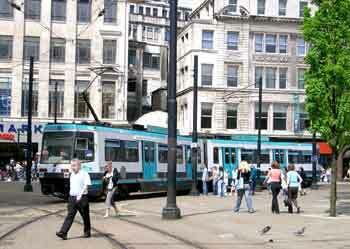 Even allowing for the more complex track layout surely Manchester does not need so many poles? (Best seen in larger image, which can be reached by clicking it). Also note (in the top two images) how both the lighting and a flag are supported by cross wires above the tram power wires . 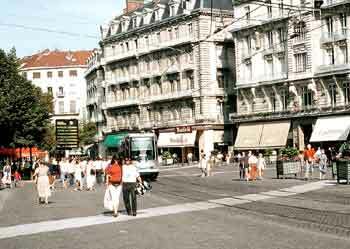 In many towns and cities it is usual for all but essential traffic to be barred from the central business and shopping areas. 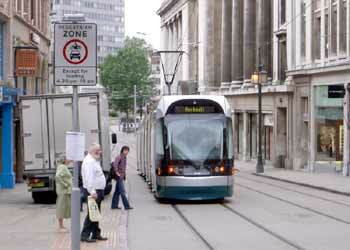 The ability to safely walk about, unhindered by noise and fumes seems to be what people want. 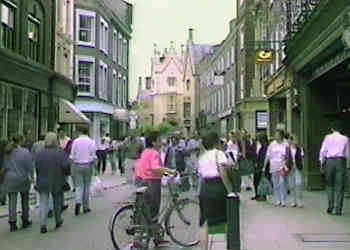 A typically British scene, a city centre pedestrian zone from which all motor traffic (including buses) has been excluded. This is Cambridge, England. Note the lady 'walking' the bicycle. 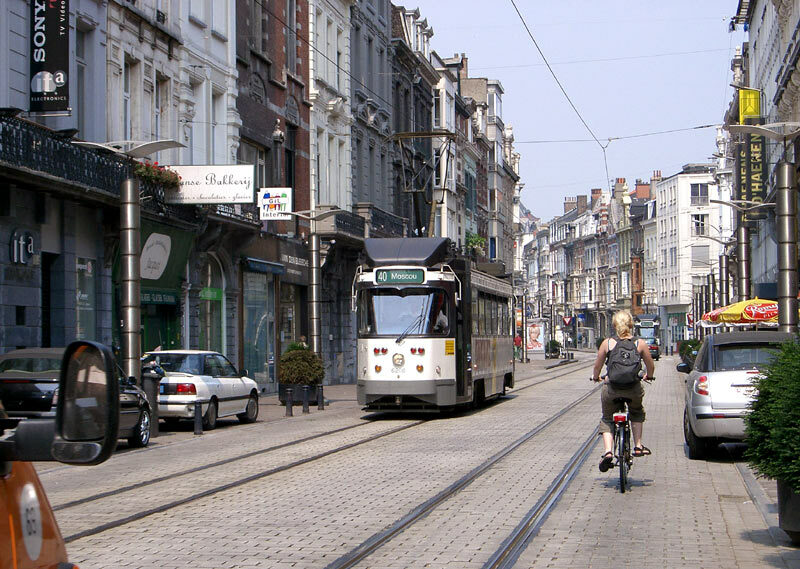 Pedestrian zone in Gent, Belgium. 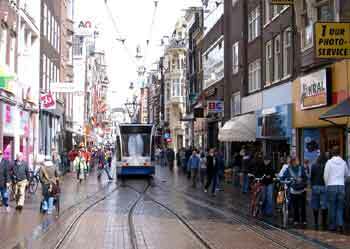 Being a narrow street trams travel along here in one direction only. The above images are video-stills - click either of them or the projector icon to see a 32 second video clip named 'Ped-zone-tram320.mpg' showing the action being described. 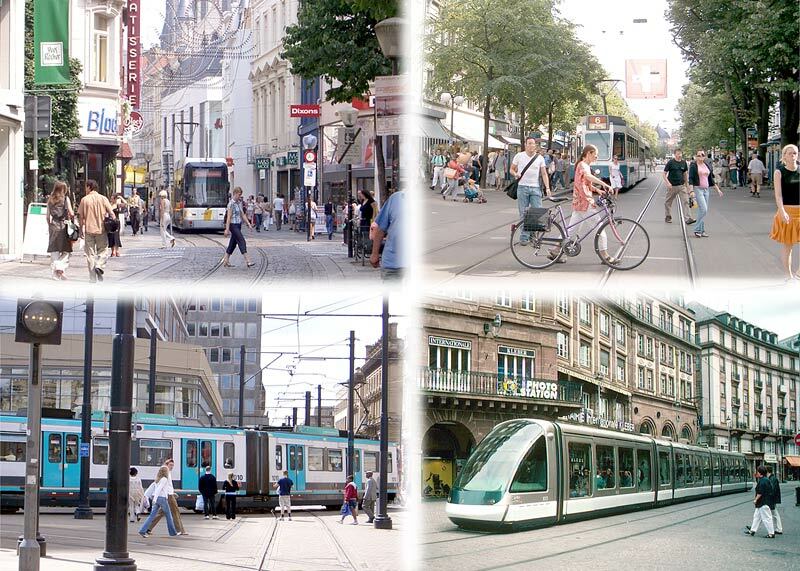 Experience has shown that with its visibly predictable path and electric traction light rail has proven to be the most successful mode of transport in meeting people's desires for accessibility to the traffic free zone with the minimum pedestrian intrusion. Traders have also found that with the transport running through the heart of the pedestrianised shopping area potential customers are better placed to look at the shop windows and the products on display while still travelling, and this visibility is good for business. Traders also welcome the night-time presence of transport helping to keep the otherwise quiet streets alive. As can be deduced from some of these pictures the Europeans do not seem to mind cyclists using their pedestrian zones; whether or not this is really so this is certainly the impression gained. Some pedestrians find cyclists more of a hazard than cars! 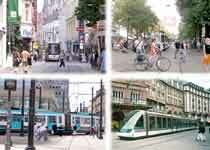 Light rail and pedestrian zone in Karlsruhe, Germany - as photographed with a 'panoramic' / 'stretch' camera. 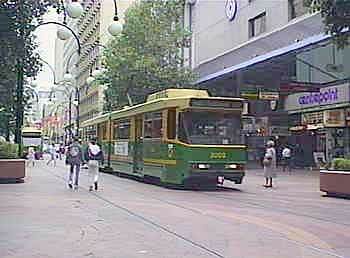 Light rail and pedestrian zone in Melbourne, Australia. Note how the street lamps and overhead wire supports are arranged on the same poles. 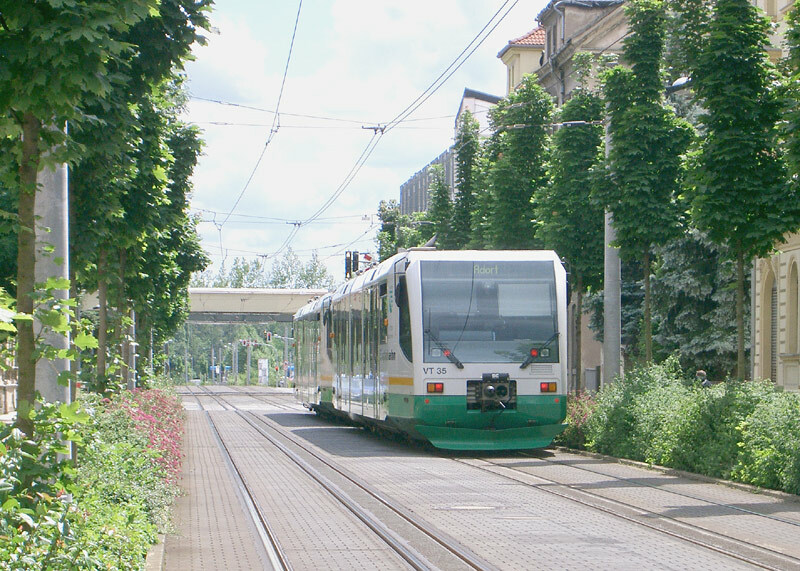 Since this was filmed the street has been repaved in a way which visually identifies the swept path of the trams, and the overhead wires now hang from wire cross spans. 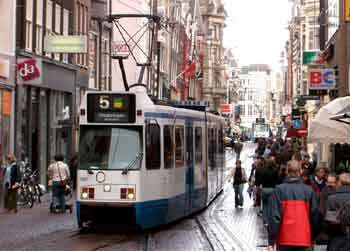 Light rail and pedestrian zone in Amsterdam, Holland. As this is a narrow road the tracks are interlaced with passing places at tram stops. 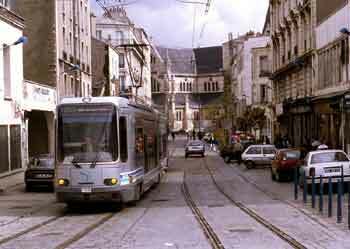 The word "revolution" conjures up an image of an armed insurrection with the head of state being forcibly driven from office; but revolutions can be peaceful and life enhancing too - for instance the new tramway in Grenoble, France which opened in 1987 had a revolutionary effect on urban transport planning and provision, leading a renaissance of the tram with (so far) 10 new systems constructed in France (plus several existing systems modernised) as well as many more in other countries too. 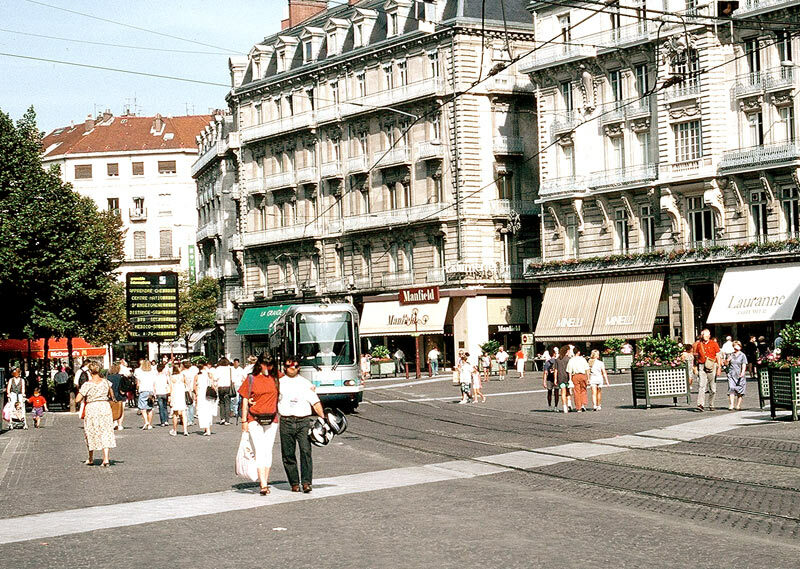 The much acclaimed light rail and pedestrian zone in Grenoble, France, which replaced a heavily congested city square. 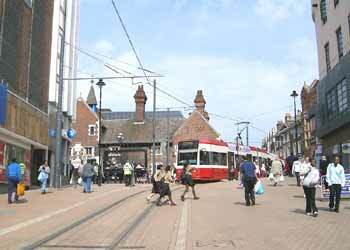 In a pedestrian zone different coloured paving stones can clearly define the route and "swept path" of the tramway without restricting the pedestrians ability to freely walk about. Many British local government (etc) planners also visited Grenoble, and enthused by what they saw drew up plans for similar systems in their conurbations too. Regrettably issues with funding their construction have seen most British proposals being stillborn. Funding issues are looked at on the Enough Stick, How About Some Carrot page. 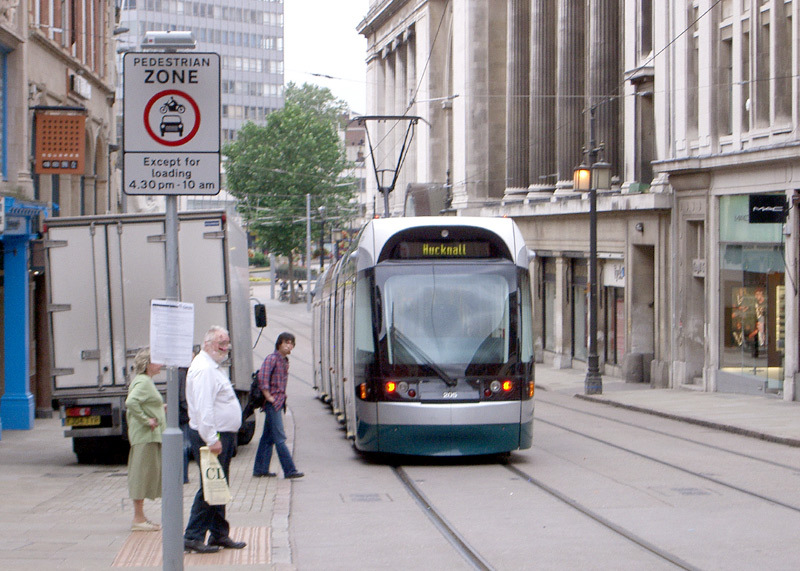 Included in the few British modern tramway systems which have been built are Nottingham (left), Manchester. (right) and Croydon (above right). 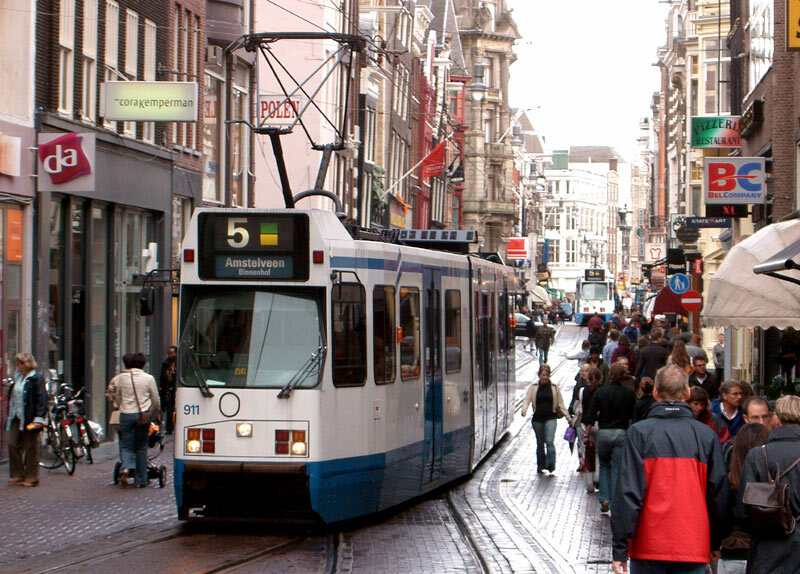 A variant on a pedestrian zone is the transit mall, which is basically a road which is primarily reserved for public transport and emergency vehicles, although sometimes there is limited local access for other traffic too. 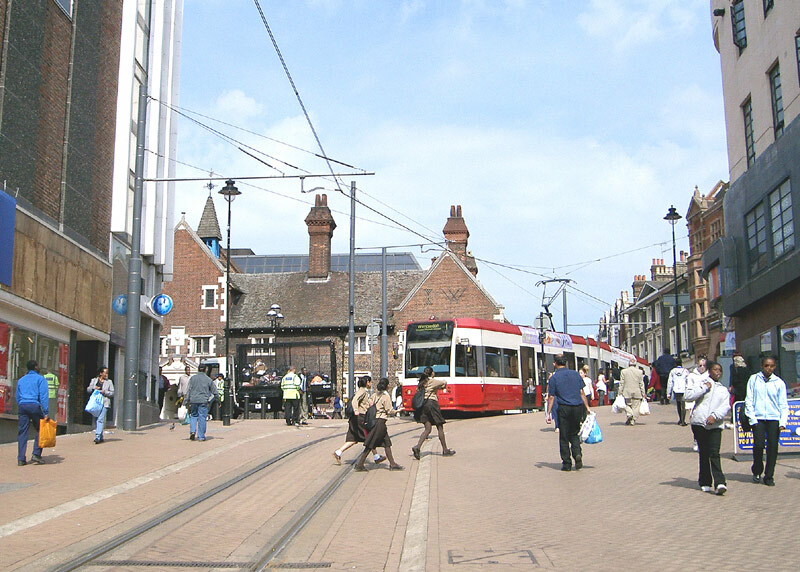 In Croydon, England, part of the transit mall uses residential roads so local access is allowed in this section. To reduce the through traffic other roads have been upgraded, road direction signs altered, street maps re-drawn to minimize this route in favour of the alternatives and at each end of the road there are bus and tram "gates" which are effectively short bus / tram only sections of road which are monitored by closed circuit television. As the road signs in the two pictures show, these 'gates' only actually operate Monday-Friday morning and evening rush hours. 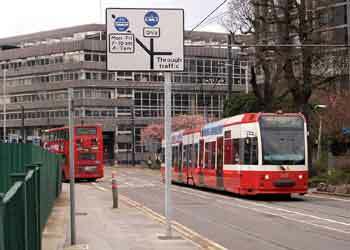 A transit mall along a residential road in Croydon, England. With the main traffic flows diverted along a parallel route this road is designated as being for trams, buses and local access only. See text (above) for full information. In Calgary, Canada, most of the stores form part of fully enclosed shopping centres located around the transit mall, which is restricted to light rail, buses and emergency vehicles only. Incidentally, this also part of the free (ie: fare less, no charge) travel zone. Several North American cities have 'Free Travel Zones', the idea being to encourage city (office) workers not to use their cars when travelling about the city centre. Such zones often benefit local traders because these city workers will take advantage of the free travel and visit local stores for their shopping instead of using car-based out of town shops. 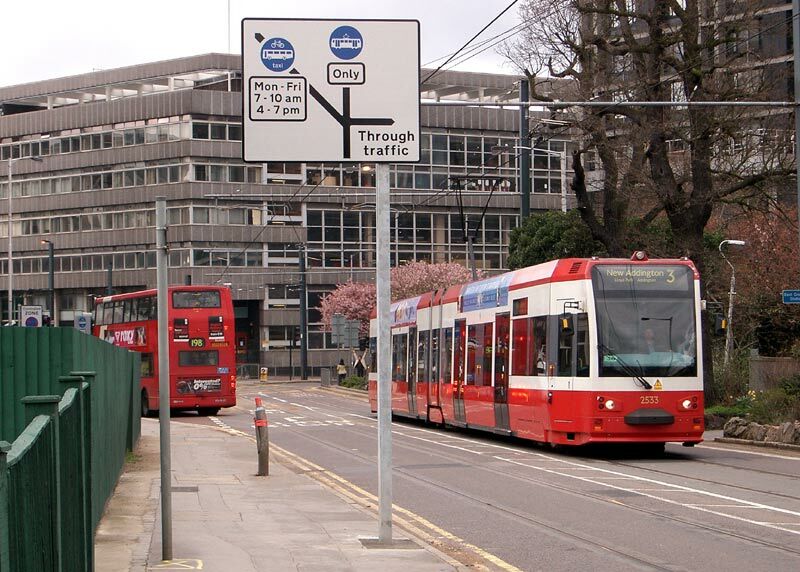 The argument against these 'Free Travel Zones' is that car commuters end up not paying for the transport, while those people who use public transport to commute will have season tickets which already provide them with city centre travel at no extra cost. funding is looked at on the Enough Stick How About some Carrot? page. Click the speaker symbol or here to download a 150kb soundclip (named Calgary.mp3) which was sourced from a video clip and is of a 'next station' announcement that also tells passengers that the free fare zone ends at the next station. 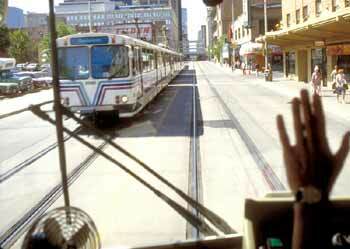 Transit mall, Calgary, Canada. Transit mall, Zwickau, Germany. 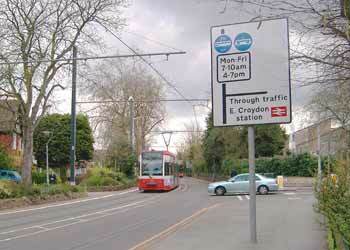 To discourage pedestrians from walking over the tracks the road is flanked by near continuous shrubs and hedges. Almost a transit mall shared with cyclists and local traffic in Gent, Belgium. A road reserved for trams and local access on tramline T1 in Paris, France. Click either the projector icon or here to see a 98 second video clip named 'Paris_access_only320.mpg' showing the above location. 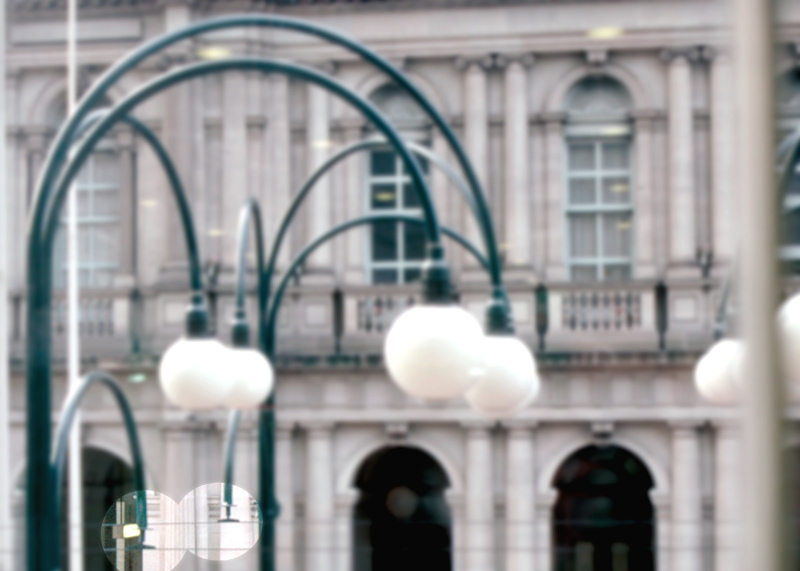 Road Junctions, Level Crossings And Traffic Signal Priority.